"Baby builds with blocks. Nature builds with quarks! Discover the subatomic world of quarks, atoms, and molecules. Accurate enough to satisfy an expert, yet simple enough for baby, this book explores the basics of particle physics and chemistry and ties it all to baby’s world. Parents and caregivers may learn a thing or two, as well!" I don't know that I've ever been as impressed with a board book as I am with this one. 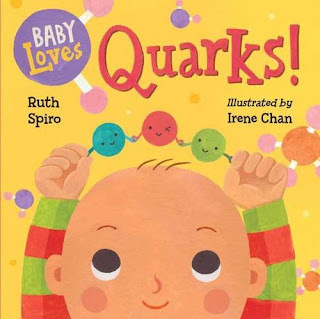 No, it doesn't quite appeal to my normal cheesy humor nor am I totally blown away by the illustrations (the usual positive reviews I include in my favorite board books), but MAN does it explain nuclear physics on the perfect level for young toddlers! ...Or, you know, man, does it explain physics for the regular layman such as myself (blush). Okay, but really, it's a perfectly short, concise explanation of the building blocks of nature, while working in the perfectly relatable story of a baby building with blocks. My own daughter LOVES building blocks and knocking them down so I really think this book connects with its target audience well and provides subtle (and super awesome) education at the same time. And don't get me wrong, the illustrations are still cute and help explain the science. Overall, awesome book, and I'm looking forward to reading Baby Loves Aerospace Engineering next! "What could be happier than a book with a dancing cake, a candy parade, and a hug monster? A book with all those things (and more) plus YOU! 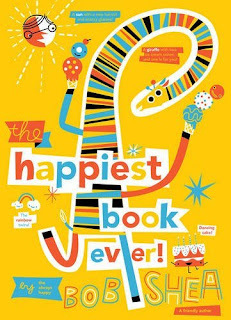 Your happy, happy thoughts will make this book super happy happy! But something seems off. Could it be that frowny frog? Perhaps we could shake some sense into him, or slap a Post-it over his face. No? Well then, maybe it's time for that frog to SCRAM! Hooray! He's gone! Time for a happy dance! Wait, what's wrong? Now NO ONE seems happy! 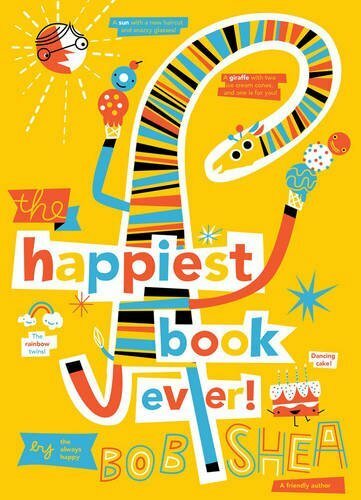 Let's see if we can't do something to truly make this the happiest book ever." This book is rather genius. A quirky, slightly silly genius. First of all, the illustrations are fun, doodle-ish, and consistently simple. The yellows and oranges with blues and grays are actually super emotive. In fact, the face that dominates the book (while really just a few lines and circles) really expresses a lot of what is going on in the story. It's a great showcase of different emotions (not just happy!). Plus, the interactive-ness makes for the perfect readaloud. I'd totally include it in my Emotions Storytime in a heartbeat. Interactive, hilarious, and a great lesson on including others. Pretty much a win win win. "Ghost has been chosen for an elite middle school track team. He has crazy natural talent, but no formal training. If he can stay on track, literally and figuratively, he could be the best sprinter in the city. But Ghost has been running for the wrong reasons. It all starting with running away from his father, who, when Ghost was a very little boy, chased him and his mother through their apartment, then down the street, with a loaded gun, aiming to kill. 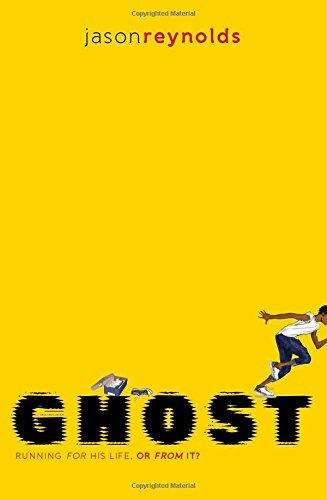 Since then, Ghost has been the one causing problems—and running away from them—until he meets Coach, an ex-Olympic Medalist who blew his own shot at success by using drugs, and who is determined to keep other kids from blowing their shots at life." Anyway, it's an awesome story. I'm glad it's a sports book that highlights track. And, the ending is perfect. Really, I recommend it and I'm sure it will be on a lot of awards' radars.